Quick point: An Outdoor UHF/VHF antenna as high above the ground as you can reasonably get it, pointed towards Quincy Illinois will get you the best reception of local DTV channels. Indoor antennas are problematic but may work at close range. If you live with in the coverage zones as shown on our coverage map you should be able to recieve WTJR. We are transmitting Channel 32 DTV showing as channel 16.1 on your reciever. A UHF/VHF* antenna will work for WTJR DTV signals. *In the Quincy Television market there are four digital television stations broadcasting a total of 13 digital signals. Digital TV allows multicasting or the ability for broadcasters to provide multiple digital TV signals. In order to receive these signals you must have a converter box or digital TV with ATSC tuner and the proper UHF / VHF antenna. 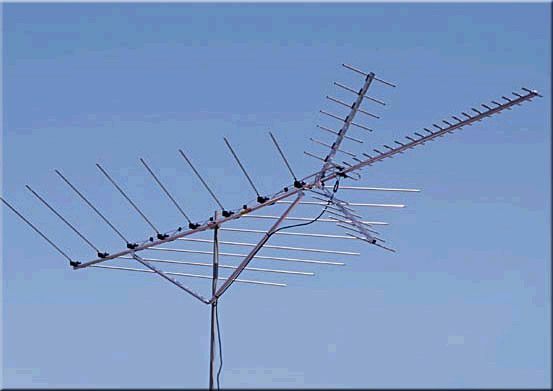 You will need an antenna that receives both UHF and VHF channels to watch all the local stations. This is a important point as many “HDTV” antenna being sold are UHF antennas. In general, dependable reception of over-the-air digital TV programming will require the same type of signal reception equipment that worked to provide good quality reception of analog TV programming. If you need a roof-top antenna to receive analog TV broadcasts, the same antenna generally will work to receive digital TV broadcasts. You should not have to purchase new antennas that are marketed as “digital ready” or “HD ready”. Although newer “HDTV” antennas may show improved performance. Federal law requires that all full-power television broadcast stations stop broadcasting in analog format and broadcast only in digital format after February 17, 2009. If you have one or more analog televisions that receive free over-the-air television programming with an outdoor antenna or “rabbit ears” on the TV, you will either need a digital television (a TV with a built in digital tuner) or an analog television connected to a “digital-to-analog converter box” (which converts digital signals to analog signals for viewing on your analog set) in order to continue to watch programming from full-power broadcast stations. First, it is important to know that if your television received good quality reception on analog channels 2-51 with a broadcast antenna, it should be able to receive digital television (DTV) signals, including high definition television (HDTV) signals, with the same broadcast antenna. You do not need to purchase a “DTV antenna” or an “HDTV antenna” to receive DTV or HDTV signals. However, consumers should be aware that if they use a digital-to-analog converter box, they will still need to use an antenna to receive DTV signals. Prior to making any changes to your current antenna or antenna system, you should check to see if it will receive the digital signals being broadcast in your area. Connect your existing antenna to either a digital television or a digital-to-analog converter box connected to an analog TV. Make sure your TV is set up to receive over-the-air broadcasts (as opposed to being connected to a paid provider such as a cable or satellite TV company). It may also be helpful to perform a “channel scan,” in which your TV will automatically check to see which stations it can receive. In many cases, this is all you will need to do to watch digital television broadcasts. What are the basic rules for TV signal reception? 1. Outdoor is generally better. Outdoor antennas have a better view of the transmitting station, with no building-induced signal loss. They receive less interference from other household electronic/electrical appliances, and they are less likely to receive reflected ghost signals from the building structure. 2. Higher is better. The higher an antenna is, the more direct signal it can receive from the TV transmitter, while at the same time reducing the reception of interfering signals from other household electronic/electrical appliances and reflected ghost-causing signals from other nearby structures. The higher the better, but any antenna should be at least four feet above the structure to which it is mounted, and ideally above the roofline. 3. Closer is better. If a position above the roofline is not possible, the antenna should at least be on the side of your building facing the TV signal broadcast tower. 4. Bigger is better. The larger an antenna, the more signal it receives. This is especially important on channels 2-6, where the longer wavelength requires a larger antenna in order to be efficiently received. Larger antennas also become directional which reduces ghosting caused by reflected signals coming from the side and the rear of the receiving antenna. What antenna do I need? All outdoor antennas must be grounded per manufacture and/or NEC electric code . http://www.hdtvprimer.com/ANTENNAS/basics.html scroll down to grounding section. Consult your local electrician to make sure you follow the NEC code.